Δίκτυο Ενημέρωσης Μικρής Λιανικής | synpeka.gr - Μια αξιολόγηση των σκευασμάτων ηλεκτρονικού τσιγάρου και αερολυμάτων για επιβλαβή και δυνητικά επιβλαβή συστατικά (HPHC) που προέρχονται τυπικά από την καύση. FDA recommends reporting HPHCs in e-cigarette e-liquids and aerosols. Combustion-related HPHCs assessed using sensitive, selective, validated methods. Combustion-related HPHCs include 3 aromatic amines, 5 VOCs, and B[a]P.
Combustion-related HPHCs were not measurable in the e-liquid tested. Also not measurable in the aerosol of e-cigarettes with disposable cartridges. U.S. FDA draft guidance recommends reporting quantities of designated harmful and potentially harmful constituents (HPHCs) in e-cigarette e-liquids and aerosols. The HPHC list comprises potential matrix-related compounds, flavors, nicotine, tobacco-related impurities, leachables, thermal degradation products, and combustion-related compounds. E-cigarettes contain trace levels of many of these constituents due to tobacco-derived nicotine and thermal degradation. However, combustion-related HPHCs are not likely to be found due to the relatively low operating temperatures of most e-cigarettes. The purpose of this work was to use highly sensitive, selective, and validated analytical methods to determine if these combustion-related HPHCs (three aromatic amines, five volatile organic compounds, and the polycyclic aromatic hydrocarbon benzo[a]pyrene) are detectable in commercial refill e-liquids, reference e-cigarette e-liquids, and aerosols generated from rechargeable e-cigarettes with disposable cartridges (often referred to as “cig-a-likes”). In addition, the transfer efficiency of these constituents from e-liquid to aerosol was evaluated when these HPHCs were added to the e-liquids prior to aerosol formation. This work demonstrates that combustion-related HPHCs are not present at measurable levels in the commercial and reference e-liquids or e-cigarette aerosols tested. Additionally, when combustion-related HPHCs are added to the e-liquids, they transfer to the aerosol with transfer efficiencies ranging from 49% to 99%. In 2012, the U.S. Food and Drug Administration (FDA) established a list of “harmful and potentially harmful constituents” (HPHCs) in cigarette smoke, cigarette filler, and smokeless tobacco products that included over 90 constituents (FDA, 2012a, 2011; FSPTCA, 2009). Tobacco product manufacturers are required to report the levels of HPHCs found in cigarettes and smokeless tobacco products (FDA, 2012b). However, due to the potential for large and unmanageable testing volumes in contract laboratories and the lack of validated analytical test methods for all HPHCs listed on the established list, FDA published an abbreviated list for initial HPHC testing and reporting requirements (FDA, 2012b). The abbreviated list comprises constituents for which validated analytical methods were thought to be established and represents several different chemical classes. E-cigarettes, also known as e-vapor products and electronic nicotine delivery systems (ENDS), are an emerging product category in the global market. On May 10, 2016, FDA published the final rule to deem e-cigarettes (referred to as ENDS) to be subject to the Federal FD&C Act, as amended by the FSPTC Act. This provides FDA authority to regulate e-cigarettes and e-liquids (FDA, 2016a). Most, if not all e-cigarettes, ultimately require a market authorization from FDA through the premarket tobacco application (PMTA) pathway to either remain on the market or to enter interstate commerce (FDA, 2016a). FDA recently published draft guidance on PMTAs for ENDS (FDA, 2016b). Within this ENDS PMTA draft guidance, FDA specifies the studies that should be conducted in order to demonstrate that the product is “appropriate for the protection of public health” including the constituents that should be considered for analysis in e-cigarette e-liquids and aerosols (FDA, 2016b). The HPHCs provided in the original ENDS PMTA draft guidance (FDA, 2016b) can be categorized based upon the constituent's potential origin (Table 1). With the exception of carbon monoxide, all of the constituents listed in the abbreviated HPHC list for conventional tobacco cigarette smoke (FDA, 2012b) are included in the ENDS PMTA draft guidance (FDA, 2016b). Table 1. The HPHCs provided in the ENDS PMTA draft guidance (FDA, 2016b) and their probable origin. HPHCs, harmful and potentially harmful constituents; NNK, 4-(methylnitrosamino)-1-(3-pyridyl)-1-butanone; NNN, N-nitrosonornicotine. ENDS products are available in a variety of configurations including small devices resembling cigarettes that are disposable or have rechargeable batteries with disposable cartridges or larger formats with rechargeable batteries and disposable prefilled or refillable tanks. When a user puffs on an e-cigarette, the e-liquid is heated, aerosolized, and inhaled. E-liquids typically contains propylene glycol (PG) and/or glycerin (often referred to as vegetable glycerol or VG), water, nicotine, and flavors. The scientific evidence demonstrating the presence of the constituents listed in the ENDS PMTA draft guidance (FDA, 2016b) (Table 1) in e-cigarette e-liquids and aerosols continues to increase using a variety of analytical techniques. It has been well demonstrated in the scientific literature that trace levels of potential impurities (HPHCs) from tobacco-derived nicotine such as tobacco specific nitrosamines (TSNAs) and nicotine-related impurities such as anabasine can be present in e-cigarette e-liquids and aerosols (Flora et al., 2016a, 2017; Goniewicz et al., 2014; Kim and Shin, 2013; Margham et al., 2016; Sleiman et al., 2016; Westenberger, 2009). While the potential formulation impurities ethylene glycol (EG) and diethylene glycol (DG) were not observed in the 20 commercial products tested by Etter et al. (2013), Westenberger (2009) observed DG in one product tested as reported in a 2009 Department of Health and Human Services memorandum. Additionally, trace levels of EG and DG were detected in select commercial e-liquid refill solutions as reported in a poster presentation by Shah et al. (2015). It has also been demonstrated by Farsalinos et al. (2015b) and Sleiman et al. (2016) that flavor compounds listed in the ENDS PMTA draft guidance (FDA, 2016b) (Table 1), such as diacetyl and acetyl propionyl, have been identified in select commercial e-vapor products. Williams et al. (2017, 2013) and Goniewicz et al. (2014) have demonstrated that some metal compounds (leachables) have also been observed in select commercial e-cigarettes depending upon the components used in the container closure system or e-cigarette cartridge (often referred to as a cartomizer). Several researchers have also established that thermal degradation products such as carbonyl compounds (e.g., formaldehyde, acetaldehyde, and acrolein) can be detected in e-cigarette aerosols at various concentrations under realistic and unrealistic use conditions, and their formation is clearly related to the temperature of the e-cigarette device during aerosol formation (Farsalinos et al., 2015c; Flora et al., 2016b, 2017; Geiss et al., 2016; Goniewicz et al., 2014; Gupta et al., 2015; Guthery, 2016; Jensen et al., 2015; Kosmider et al., 2014; Margham et al., 2016; Sleiman et al., 2016; Talih et al., 2017; Talih et al., 2016; Uchiyama et al., 2013). Talih et al. (2017) recently demonstrated that some refillable high power sub-Ohm devices (coil resistance well below 1 Ohm) can produce carbonyl levels far greater than conventional cigarettes and explored the interaction between power and device geometry on carbonyl formation. However, it is well recognized that for commercial rechargeable e-cigarettes with disposable pre-filled cartridges (often referred to as cig-a-likes) the levels of these HPHCs found in e-cigarette aerosols are typically far below those found in conventional tobacco cigarettes (Farsalinos et al., 2015b; Flora et al., 2017, 2016b; Goniewicz et al., 2014; Laugesen, 2015; Margham et al., 2016; Tayyarah and Long, 2014). While the body of evidence regarding some potential HPHCs in e-cigarette e-liquids and aerosols continues to grow, as discussed above, the presence of combustion-related HPHCs in e-cigarette e-liquids and aerosols remains relatively unclear. The combustion-related HPHCs listed in the ENDS PMTA draft guidance (FDA, 2016b) include three aromatic amines (1-aminonaphthalene (1-NA), 2-aminonaphthalene (2-NA), and 4-aminobiphenyl (4-ABP)), five volatile organic compounds (VOCs) (1,3 butadiene, isoprene, acrylonitrile, benzene, and toluene), and the polyaromatic hydrocarbon (PAH) benzo[a]pyrene (B[a]P) (Baker and Bishop, 2004; FDA, 2016b; Fowles and Dybing, 2003; McGrath et al., 2007; Piadé et al., 2013). The mechanism of aerosol formation by e-cigarettes does not involve temperatures at or near those of combustion. Typical rechargeable e-cigarettes with disposable pre-filled cartridges (e.g., cig-a-likes) have low operating temperatures relative to conventional tobacco cigarettes at less than 350 °C (coil temperature) compared to 900 °C, respectively (Baker and Bishop, 2004; Flora et al., 2017; Geiss et al., 2016; Zhao et al., 2016). For this reason, it is highly unlikely that these types of e-cigarette would reach the temperatures found in conventional tobacco cigarettes where pyrolysis and combustion occur (>400 °C) (Baker, 1975). Select VOCs in e-cigarettes have been reported in a few publications with mixed results (Goniewicz et al., 2014; Han et al., 2016; Herrington and Hays, 2012; ISO, 1999; Kim and Kim, 2015; Lim and Shin, 2017). Han et al. (2016) and Lim and Shin (2017) report finding both benzene and toluene in refill solutions sold in the Chinese market. While aerosols were not tested, Lim and Shin (2017) attributed the VOC contamination in the e-liquids to the use of petrigenic hydrocarbons for extracting flavors and nicotine. Pankow et al. (2017) recently observed that two tank systems with user accessible power settings could form benzene in the aerosol with specific additives and under high power setting. Goniewicz et al. (2014)analyzed for 11 VOCs using a modified smoking apparatus and found toluene and m,p-xylene in 10 of 12 sample aerosols commercially available in Poland. However, m,p-xylene was also detected at comparable levels in the blank samples. In another example published by Herrington and Myers (2015), benzene and toluene were detected (but not quantified) in the e-cigarette aerosol tested and were also observed in the blank laboratory air samples. It was recently demonstrated by Margham et al. (2016) that laboratory background levels can lead to “false-positive results and overestimates.” For aerosol analysis, background contamination can come from air, analytical equipment, and reagents used in the laboratory particularly if the same laboratory has been used to collect and measure cigarette smoke where these constituents are found at relatively high levels (Margham et al., 2016; McAuley et al., 2012; Rawlinson et al., 2017). For example, Margham et al. (2016) demonstrated that for the e-cigarette tested (ePen) in their study, the level of toluene detected showed “no significant difference between ePen and air/method blank emissions.” In addition, all other combustion-related volatiles listed in the ENDS PMTA draft guidance (FDA, 2016b) were either below the detection limit (in most cases) or were not quantifiable in both the sample and the air blanks under multiple machine puff volumes (Margham et al., 2016). Tayyarah and Long (2014) recently investigated select analytes in the aerosol of five leading commercial e-cigarettes in the U.S. market including the combustion-related HPHCs listed in the ENDS PMTA draft guidance (FDA, 2016b) (Table 1). All measurements were made in an International Organization for Standardization (ISO) 17025 accredited laboratory with validated methods. While background levels of select constituents were observed in air control samples, none of the e-cigarettes aerosols tested in this study contained detectable levels of the combustion-related constituents (Table 1) above the air control sample levels. Flora et al. (2016b) also recently demonstrated that the combustion-related constituents listed in the ENDS PMTA draft guidance (FDA, 2016b) (Table 1) were not detectable for two commercial e-cigarettes. In a report by Laugesen (2008), it was reported that trace levels of PAHs were found in the aerosol of one e-cigarette cartridge; however, the PAHs found in the reported study were not on the list provided in the ENDS PMTA draft guidance (FDA, 2016b) and thus did not contain B[a]P. Han et al. (2016) observed trace levels of B[a]P in select e-liquids sold in the Chinese market. They attributed the PAH contamination to a discrete source such as the solvent used to make the e-liquids. Flavor extracts derived from natural products (e.g., tobacco) can have a variety of complex ingredients. Depending upon how the natural product was handled or processed prior to extraction, combustion-related HPHCs may be present in the flavor extracts. A few combustion-related HPHCs have been reported at trace levels in indoor air quality studies using e-cigarette aerosols as well (McAuley et al., 2012; Schober et al., 2014). McAuley et al. (2012) detected VOCs and PAHs in the e-cigarette aerosols measured for an indoor air quality assessment. However, it should be noted that most VOCs were below the limits of detection, they were orders of magnitude lower than the cigarette smoke tested, and comparable levels were detected in the blank samples. PAHs were also detected in one of the blanks samples as well (McAuley et al., 2012). The study authors also state that “An anomaly was found with benzo(a)pyrene as it was found at similar levels in e-cigarette vapor, tobacco smoke, and the blank sample” and furthermore, “Lauterbach et al. … found contrasting results and noted benzo(a)pyrene was below their [limit of detection] for e-cigarette vapor but more than 40 times higher in tobacco cigarette smoke” (Lauterbach et al., 2012; McAuley et al., 2012). Schober et al. (2014) also reported VOCs and B[a]P in an indoor air quality assessment using e-cigarette consumers and 2 h “vaping sessions.” However, the only VOC listed in the ENDS PMTA draft guidance (FDA, 2016b) and detected in their study was benzene, and it was also observed at a comparable level in the blank “no vaping” sample. B[a]P was only detected in one of six 2 h “vaping sessions,” and it was just above the limit of quantification (LOQ) (Schober et al., 2014). In an effort to contribute to this growing science and evidence related to HPHCs that can be present in e-cigarette e-liquids and aerosols, there are two objectives of the work discussed herein. The first objective was to further explore, using sensitive, selective, and validated analytical methodologies, the presence of combustion-related HPHCs in e-liquids and the aerosols of commercial rechargeable e-cigarettes with disposable pre-filled cartridges (e.g., cig-a-likes) in the U.S. marketplace. The second objective was to determine the aerosol transfer efficiency of combustion-related HPHCs added (fortified) to the pre-filled cartridge of an e-cigarette. These types of studies can potentially inform regulatory agencies of the most meaningful analytes to include in regulatory guidance and inform e-liquid and e-cigarette manufacturers as to which compounds to monitor for quality control and during stability studies. All testing methodologies for e-cigarette e-liquids and aerosols were validated based upon the 2005 International Conference on Harmonisation (ICH) guideline “Validation of Analytical Procedures: Text and Methodology Q2(R1)” (ICH, 2005). Statistical significance was determined using a two-tailed t-test (P-value of 0.05) conducted using Microsoft Excel. Commercially available e-cigarettes (rechargeable e-cigarettes with disposable pre-filled cartridges) and refill e-liquids (intended for refillable devices) used for this investigation were either purchased at retail locations or ordered through the internet. Thirteen commercial refill e-liquids were tested covering a range of nicotine concentrations (0.6%–1.2%), PG/glycerin ratios (e.g., 20/80 and 50/50, v/v), and flavor directions (sweet, fruit, coffee/tea extract, tobacco). The aerosol from six of the top-selling commercial rechargeable e-cigarettes with disposable pre-filled cartridges in the U.S. were also tested, including MarkTen® XL e-cigarettes (Nu Mark LLC, an Altria company, Richmond, VA) with disposable cartridges with flavors Classic (2.4% nicotine by weight (NBW)) and Menthol (3.5% NBW). The e-cigarettes tested (dimension and resistance provided in Table 2) were low power (due in part to size of the battery) with coil resistance greater than 2.5 Ohms and cartridge fill volumes ranging from approximately 700 to 1000 μL. Coil resistance was measured using a Fluke 289 True-RMS Industrial Logging Multimeter (Fluke Corporation, Everett, WA). A series of reference formulations (Table 3) were also prepared in our laboratory in order to investigate the possible formation and transfer of combustion-related HPHCs. These reference formulations were used during method validations as well as aerosol constituent analysis. The formulations were designed to evaluate whether there was any specific contribution from water, PG, glycerin, or nicotine. Aerosols were generated for the reference e-liquids using empty MarkTen® cartridges that had been filled with each reference e-liquid. PG, propylene glycol; NBW, nicotine by weight. Reference e-liquid 1 (15% water, 2.5% NBW in a 50/50 mixture of PG and glycerin) was fortified (spiked) with the combustion-related HPHCs at “low” and “high” concentrations within the dynamic ranges of the methods described vide infra. Samples were fortified to estimate transfer efficiency to the aerosol, and the fortification levels are listed in Table 5. Only the “high” fortification level was evaluated for transfer efficiency for the five VOCs due to the concentration of the commercially prepared stock solution (“low” was outside of the dynamic range). Table 4. Combustion-related HPHC limits of quantitation and estimated limits of detection. 1-NA, 1-aminonaphthalene; 2-NA, 2-aminonaphthalene; 4-ABP, 4-aminobiphenyl; B[a]P, benzo[a]pyrene; HPHC, harmful and potentially harmful constituent; LOQ, limit of quantification; LOD, limit of detection. LOQ and LOD for the aerosol are calculated assuming 100 mg of aerosol per 25 puff collections. Table 5. Fortification levels used for each of the combustion-related HPHCs measured and the transfer efficiencies for each compound when using a 5 s puff duration. 1-NA, 1-aminonaphthalene; 2-NA, 2-aminonaphthalene; 4-ABP, 4-aminobiphenyl; B[a]P, benzo[a]pyrene; HPHC, harmful and potentially harmful constituent. All aerosol collections were conducted under ISO smoking environmental conditions (ISO, 1999) with temperature at 22.0 °C ± 2.0 °C and relative humidity at 60% ± 5%. The protocol for aerosol collection was based upon the Health Canada Intense (HCI) smoking regime (Health Canada, 1999) puff volume and puff interval; however, a square wave puff profile with a 5 s puff duration was used (unless otherwise noted) and ventilation blocking was not applicable to the e-cigarette designs. The protocol was also similar to Cooperation Centre for Scientific Research Relative to Tobacco (CORESTA) Recommended Method (CRM) No81 (CORESTA, 2015) (machine aerosol generation) with the exception of puff duration. 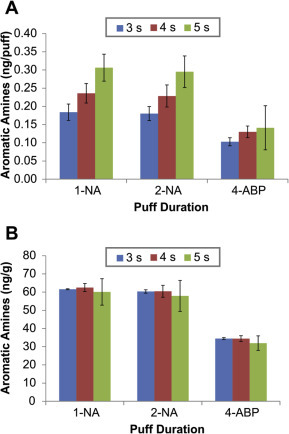 A total of 25 puffs (∼100–150 mg of aerosol) were collected for each aerosol constituent evaluation using a 55 mL puff volume, a 5 s puff duration, and a 30 s puff interval. The puff duration selected for the collection and analysis of the combustion-related HPHCs (5 s) was greater than the average puffing topography of experienced e-cigarette users, to the best of our knowledge at this time, in order to maximize aerosol collection (Vansickel et al., 2014). As puff duration determines the time in which the coil is heated (for these puff activated e-cigarettes), it is directly related to the amount of aerosol that is generated. For the transfer efficiency studies, all collections were conducted using the conditions listed above using a 3, 4, and 5 s puff duration. All device batteries were fully charged prior to aerosol collection, and the cartridges were loaded (filled) with 900 mg of e-liquid (typical commercial loading for these devices). The limits of quantitation (LOQs) and limits of detection (LODs) for the aerosol (Table 4) are calculated assuming 100 mg of aerosol per 25 puff collections. In order to prevent cross-contamination with conventional tobacco smoke, all aerosol collections were conducted in a conditioned laboratory room and on equipment that is only used for the collection of e-cigarette aerosols. Additionally, blank collections were always analyzed concurrently with the aerosol samples to confirm that background contamination had not occurred. A gas chromatography with mass spectrometry (GC-MS) method using chemical ionizationin the negative chemical ionization mode (NCI) was developed and validated to quantitatively determine 1-aminonaphthalene (1-NA) (CAS #134-32-7), 2-aminonaphthalene(2-NA) (CAS #91-59-8), and 4-aminobiphenyl (4-ABP) (CAS #92-67-1) in e-cigarette e-liquids and aerosols. Standards were purchased from Sigma-Aldrich (Milwaukee, WI) and deuterated internal standards from CDN Isotopes (Quebec, Canada). For e-cigarette aerosol analysis, aerosol was collected on a 44 mm glass fiber mat pad (Cambridge Filter Pad, CFP) using the puffing parameters discussed in Section 2.2 on a linear 20-port Borgwaldt (KC Automation, Richmond, VA) smoking machine. Prior to analysis, both the e-liquids and CFPs were fortified with 200 μL of deuterated internal standards (100 ng/mL for 1-NA and 2-NA, and 50 ng/mL for 4-ABP). CFPs or 0.3 g of e-liquid were extracted with 2 mL of water and 10 mL of toluene. To these extracts, 50 μL of trimethylamine were added, and then the samples were derivatized with 50 μL of heptafluorobutyric anhydride (Fisher Scientific, Pittsburgh, PA). Samples were allowed to derivatize at room temperature for 40 min. After derivitization was complete, 5 mL of the top toluene sample layer was then loaded onto a florisil solid phase extraction (SPE) device (catalog # WAT043385, Waters Corp., Milford, MA). Dichloromethane (8.5 mL) was added to each SPE cartridge and the eluate was collected. An aliquot of the eluate was transferred into autosampler vials and samples were analyzed by an Agilent 7890B GC with an Agilent 5977A MS in the NCI mode. All samples were extracted and tested in triplicate. The LOQs and LODs are listed in Table 4. This method was developed and validated to quantitatively determine five VOCs including 1,3-butadiene (CAS #106-99-0), isoprene (CAS #78-79-5), acrylonitrile (CAS #107-13-1), benzene (CAS #71-43-2), and toluene (CAS #108-88-3) in e-cigarette e-liquids and aerosols. The method was adapted for e-cigarette analysis from CRM No 70 (CORESTA, 2014). ISO Guide 34 custom standard and internal standard stock solutions were commercially prepared by Accustandard, Inc. (New Haven, CT). The internal standards used for this method were benzene-d6 and toluene-d8. E-cigarette aerosol was collected on a linear 20-port Borgwaldt (KC Automation, Richmond, VA) smoking machine after passing through a CFP followed by one fritted-impinger trap containing 20 mL purge-and-trap-grade methanol that was cryogenically cooled (−70 °C) using a slurry of 2-propanol and dry ice. The CFP was used to remove the PG/glycerin matrix and was not used in the analysis since it was determined that the spiked VOCs pass through the CFP. The resulting impinger solution was analyzed by GC-MS with electron ionization (EI). E-liquids were extracted using 0.3 g of formulation to 10 mL of methanol and also analyzed by GC-MS with EI. The LOQs and LODs are listed in Table 4. This method was developed and validated to quantitatively determine B[a]P (CAS #50-32-8) in e-cigarette e-liquids and aerosols. The method of analysis was adapted for e-cigarette analysis from CRM No 82 (CORESTA, 2017) and ISO standard 22634:2008 (ISO, 2008). The method was adapted for e-cigarette aerosol by implementation of the aerosol collection discussed in Section 2.2 on a linear 20-port Borgwaldt (KC Automation, Richmond, VA) smoking machine. B[a]P was purchased from Sigma-Aldrich (St. Louis, MO), and all other reagents were purchased from Fisher Scientific (Pittsburgh, PA). For e-cigarette aerosol analysis, aerosol was collected on a 44 mm CFP using the puffing parameters discussed in Section 2.2. Prior to analysis, both e-liquids and CFPs were fortified with deuterated internal standards (10 ng/mL). CFPs or 0.3 g of e-liquid were extracted with 2 mL of water and 10 mL of toluene. An aliquot of the toluene layer was removed, transferred to an autosampler vial, and analyzed by GC-MS with EI. The LOQs and LODs are listed in Table 4. For the research discussed herein, analytical methods for e-cigarette e-liquids and aerosolswere developed for the combustion-related HPHCs listed in the ENDS PMTA draft guidance (FDA, 2016b) including three aromatic amines (1-NA, 2-NA, and 4-ABP), five VOCs (1,3 butadiene, isoprene, acrylonitrile, benzene, and toluene), and one PAH (B[a]P). These methods were fully validated based upon the 2005 ICH guideline “Validation of Analytical Procedures: Text and Methodology Q2(R1)” (ICH, 2005). Additionally, substantial precautions were taken in order to reduce or eliminate potential background contamination from tobacco and tobacco smoke combustion-related HPHCs during the e-cigarette e-liquid and aerosol sample preparation and analysis. It is not uncommon for researchers who measure constituents in conventional tobacco cigarette filler and smoke to also measure constituents in e-cigarette e-liquids and aerosols within the same laboratory. Tobacco and tobacco smoke are extremely complex matrices containing thousands of chemicals including many of the HPHCs listed in the ENDS PMTA draft guidance (FDA, 2016b; Baker, 2006) at levels much higher than in e-cigarette e-liquids and aerosols (Goniewicz et al., 2014; Farsalinos et al., 2015a). Considerable precautions must be taken to prevent cross-contamination between the tobacco and e-cigarette samples (Rawlinson et al., 2017). For example, VOCs can off-gas from cigarette smoke condensate that has built up over time in the smoking machine and B[a]P can adhere to aerosol collection glassware. For this research, in order to prevent cross-contamination with conventional tobacco smoke, all aerosol collections were conducted in a conditioned laboratory room that was only used for the collection of e-cigarette aerosols. Only smoking machines that had never been used previously to collect tobacco smoke or were thoroughly cleaned were used. For the e-cigarette aerosol collections methods involving CFPs, the pad holders and transfer lines used on the smoking machines had never been used for tobacco cigarette smoke collection and were thoroughly cleaned with methanol prior to analysis to remove potential contamination. Additionally, blank collections were always conducted and analyzed concurrently with the aerosol samples to confirm that background contamination had not occurred. For the analysis of the 13 commercial refill e-liquids covering a range of nicotineconcentrations (0.6%–1.2%), PG/glycerin ratios and flavor directions (sweet, fruit, coffee/tea extract, tobacco), none of the combustion-related HPHCs were detected (all below the LOD, Table 4) in any of the commercial refill e-liquids. All e-liquid samples were tested with three extraction and analysis replicates. For the analysis of six of the top-selling commercial e-cigarettes, none of the combustion-related HPHCs were detected in the aerosols (below the LODs, Table 4). For the five reference e-liquids, none of the combustion-related HPHCs were detected in the aerosols. All aerosols samples were tested with five separate aerosol collections and analysis replicates. Thus, no detectable combustion-related HPHCs were generated in the commercial and reference e-cigarettes during the aerosolization process. While it is highly unlikely that the combustion-related HPHCs such as the three aromatic amines (1-NA, 2-NA, and 4-ABP), the five VOCs (1,3 butadiene, isoprene, acrylonitrile, benzene, and toluene) and the one PAH (B[a]P) are generated during the formation of the aerosol as discussed above, combustion-related HPHCs may be present in the e-liquids if the manufacturer uses flavor extracts or other ingredients that contain these compounds. Therefore, the second objective of this research was to determine the transfer efficiency of these combustion-related HPHCs to the aerosol if they were added (fortified) to the e-cigarette e-liquids. The fortification levels used for each of the combustion-related HPHCs measured in this study and listed in the ENDS PMTA draft guidance (FDA, 2016b) are shown in Table 5, along with the transfer efficiencies for each compound collected using a 5 s puff duration and collecting 25 puffs. Note that high fortification levels only were used for the VOCs evaluation. Transfer rates for these fortified e-liquids ranged from 49% to quantitative transfer (99%). Whereas aerosol collections to measure the transfer efficiency of aromatic amines were taken 13 h after the cartridges were filled, the aerosols for the B[a]P and VOC analyses were collected 1 h after filling the cartridge. It was observed during method development that for B[a]P and VOCs, the time between fortification and aerosol collections affected the measured transfer efficiency. It was observed that B[a]P fell out of solution or was retained by the cartridge. A cartridge contact study was conducted, in which the fortified e-liquid was added to an empty MarkTen® commercial cartridge. The e-liquid was sampled at time zero, 4 h, 16 h, 24 h, 3 d, and 12 d. The measured concentration declined over the course of the study and ultimately, it was observed that ∼65% of the B[a]P fell out of solutions or was retained by the cartridge after 12 d.
VOCs are highly volatile and are likely to quickly evaporate from solution after they are added. Fig. 1 shows a summary of the VOC stability study that was conducted. 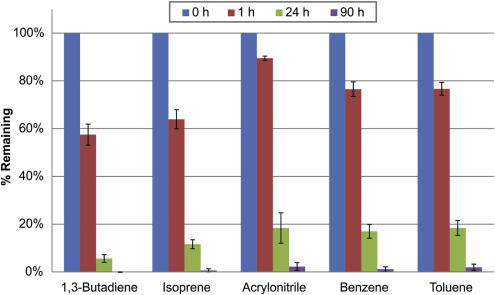 In this stability study, e-liquids fortified with the VOCs listed in Table 5 were added to MarkTen®commercial cartridges and measured at time zero, 1 h, 24 h, and 90 h. It was observed that more than 95% of the VOCs were lost from the formulation after 90 h.
Because of the volatility of the VOCs, transfer efficiencies were determined based upon the difference in concentration from the e-liquid sampled at the time of the aerosol collection compared to the aerosol concentration. It is stated in the ENDS PMTA draft guidance (FDA, 2016b) that “Evaluating new tobacco products under a range of conditions, including both non-intense (e.g., lower levels of exposure and lower volumes of aerosol generated) and intense (e.g., higher levels of exposure and higher volumes of aerosol generated), enables FDA to understand the likely range of delivery of emissions” (FDA, 2016b). Therefore, transfer efficiencies were also measured at various puff durations: 3 s (example of a potential non-intense exposure), 4 s, and 5 s (example of a potential intense exposure) to determine if puff duration had a meaningful effect. On a weight/puff basis (e.g., ng/puff), a linear increase in analyte concentration was observed for all the combustion-related HPHCs measured and listed in the ENDS PMTA draft guidance (FDA, 2016b). When normalized on a weight by weight basis (e.g., ng/g), there was no statistically significant difference on the amount of analyte per mass of aerosol collected suggesting a consistent delivery across the puff duration. For example, Fig. 2 shows the transfer efficiencies for aromatic amines on a nanogram per puff and weight by weight basis (ng/g). These results demonstrate that the combustion-related HPHC transfer from fortified e-liquids is a function of coil heating time and that transfer is proportional to the amount of aerosol generated. Fig. 2.Transfer efficiencies for aromatic amines on a nanogram per puff (A) and weight by weight basis (ng/g) (B) using a 3, 4, and 5 s puff. The number of replicates were 3, 5, and 13 for 3, 4, and 5 s puff durations, respectively. The mechanism of aerosol formation by e-cigarettes does not involve combustion. Under normal operating conditions, rechargeable e-cigarettes with disposable pre-filled cartridges have low operating temperatures relative to conventional tobacco cigarettes (<350 °C vs. 900 °C) (Baker and Bishop, 2004; Flora et al., 2017; Geiss et al., 2016; Zhao et al., 2016). Using sensitive, selective, and validated methodologies, it was demonstrated that the combustion-related HPHCs listed in the ENDS PMTA draft guidance (FDA, 2016b) including three aromatic amines (1-NA, 2-NA, and 4-ABP), five VOCs (1,3 butadiene, isoprene, acrylonitrile, benzene, and toluene), and one PAH (B[a]P) are not present at measurable levels in the commercial and reference e-liquids or the e-cigarette aerosols tested in this study. This research also evaluated the transfer efficiencies of the combustion-related HPHCs using reference e-liquids that were fortified with the compounds of interest. It was observed that, from an e-cigarette with a disposable pre-filled cartridge, transfer rates for these fortified reference e-liquids ranged from 49% to quantitative transfer. It was also observed that B[a]P can fall out of solution and/or be retained by the e-cigarette container closure (i.e., the device). VOCs were also observed to be unstable in the reference e-liquids, where more than 95% of the VOCs fortified in the reference e-liquids added to commercial cartridges were lost within 90 h. Because contamination from conventional cigarette smoke is a potential source of false positive identification of constituents, considerable measures were taken throughout this study to avoid contamination from such sources when determining the levels and transfer efficiencies of the HPHCs in e-cigarette formulations and aerosols. In the ENDS PMTA draft guidance, it is stated that “FDA intends to establish a revised list of harmful and potentially harmful constituents (HPHCs) that include HPHCs in ENDS products in the Federal Register, issue guidance regarding constituent reporting (i.e., harmful or potentially harmful constituent (HPHC) reporting) under section 904(a)(3) of the FD&C Act, and later issue a testing and reporting regulation as required by section 915” (FDA, 2016b). FDA also states that “HPHC information submitted under section 904 will assist FDA in assessing potential health risks and determining if future regulations to address a product's health risks are warranted” (FDA, 2016b). Therefore, it is critical to establish the scientific basis for the constituents (e.g., HPHCs) that are appropriate to monitor for the ENDS product category. It is recommended that manufacturers of e-cigarettes monitor the e-cigarette e-liquid and aerosol chemistry through comprehensive stability studies (including devices filled with their respective e-liquids) to determine the product's shelf-life and factors that affect its stability. FDA recommends the constituents to test during these stability studies, including a variety of chemicals and origins as described in Table 1. Many of the HPHCs recommended have been demonstrated to be present in e-liquids and aerosols; however, based upon recent research and the observations discussed herein, it is likely that it is not necessary to monitor combustion-related constituents during a stability study if the manufacturer has confirmed that they are not present in the e-cigarette e-liquid (Flora et al., 2016b; Margham et al., 2016; Rawlinson et al., 2017; Tayyarah and Long, 2014). Provided the manufacturer demonstrates that their product(s) does not reach combustion level temperatures (e.g., >400 °C) (Baker, 1975), combustion-related HPHCs will not form during aerosol formation. As the body of scientific research related to e-cigarette e-liquids and aerosols continues to increase, these types of studies can potentially inform regulatory agencies of the most meaningful analytes to include in regulatory guidance and inform e-liquid and e-cigarette manufacturers as to which compounds to monitor for quality control and during their stability studies.